Even through the darkest times, your love still shines through. This drawing is to say thank you. Things have been dark for me the last few years, very dark indeed; and knowing there is love and support out there means a lot. The internet and social media can really demonised, but the truth is they can help us connect, find understanding, and love. Thank you for sticking through the bad times as well as the good. I know I don't often post during the dark times, but I'm still here; listening. Reading your kind words, and having your support lift me up. I'll probably still have ups and downs, and times where I need extra support, recovery is not linear. But I'm feeling connected at the moment, and I can't wait to share new exciting things with you! I had an online friend who was there for me at such a critical time in my life. Your painting says it all. Love it! I know that this isn't what the picture is about, but it reminds me of the struggles of a long distance relationship. Ever since my boyfriend moved we haven't been able to see eachother as much, and his parents don't approve of our relationship (even though we've been best friends since we were little kids and we're the same age) so they try to keep us apart. But even through all the miles we're still there for eachother and taking care of us. I simply have to fav this . . . So beautiful and full of emotion . . .
Would you mind teaching me to draw like this? I really love your art and I've always wished I could create art of such quality. I still don't quite have an art setup, but once I do I'd really love it if I could get your advice on different things. You've done more than draw pictures, you've told us a story. A story of your life. A story that's had ups and downs and taken us all over the place. But now, you have triumphed. And this beautiful picture is a reflection of that. Beautiful drawing & message. Mesmerizing colors. Vibrant, Stunning, and Compelling Artwork!!! P.S. The Internet has it's moments but I personally think DeviantArt makes it shine brightest with this community of camaraderie. I love the internet. No matter how many miles are separating you from your friends, you are still conected. we who hurt must help each other, for those who hurt us never will. we hold each other up high and never let go. when times are worst is when we shine the brightest. you're never alone unless you cut yourself off from everyone. never abandon yourself, i will always be here and i'm pretty sure there are a lot of others who won't either. 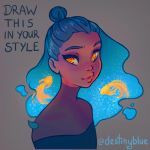 Glad to see the redraw challenge is this popular and that you can find proper support here. The coloring and expression look great and I like the pose as well . Three photos ago when you popped up again on my notifications. I instantly clicked to your page to see your drawing and read about it. It's not just the art i like looking at. We like hearing from you too. I used to feel the same way. I wish I still did, it was such a powerful force for good in my life and really inspired me to keep moving forward. Feeling connected to people who were willing to support me while things were tough brought such an incredible light in my life that for a while, instead of having PTSD, I had what they call PTG - Post-Traumatic Growth. It brought me such a love and appreciation for the world and all I ever wanted to do was give that love and consideration back to the world in kind. Things did not work out so well for me. Eventually something happened and that support I'd had turned sour at a pivotal moment. I closed myself off as a result, and haven't felt entirely safe enough to really open up since. Years later, I am trying to fix that because my resulting solitude has made matters so much worse but... it's very hard to be comfortable enough with doing that again. Once bitten, twice shy. It's a lot of why I stick around, personally. I absolutely love your work and your message, I love what you stand for and what you're trying to achieve for yourself and the world alike and I want to support you in all of this, but in the unlikely case that you have an experience similar to my own, I want to make sure you still at least have one person to go to. I hope you will never need a fallback, but if you do I will gladly be one. You, I would gladly give the same courtesy that I give my best friend. Awesome, I won't blemish your lovely art by attempting my own version. I love this so much it's just so pretty and brightly colored! Beautiful work destiny! Always here to support! And keep up the great work! Lovely art things will get better for you blue. Beautiful drawing as always! Keep up the amazing work. ...We're all behind you Blue! Here's to many more years ahead! You have become my go-to for when I'm feeling my anxiety in full force. Such beautiful and inspiring art really helps me cope. Thank you so much! It is so SO refreshing to see art about social media/mobile phones/technology that is not more of the dumb "hurr hurr technology is bad, fire is scary and Tesla was a witch". Like, I cannot express how much I love this. I might still throw one your way if I can figure out how to properly do it in CG.